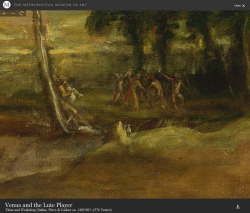 The Met’s new online Collections system sets the gold standard. Three hundred and fifty thousand works are mapped to standard vocabularies, and organized into simply understandable and accessible Who-What-When-Where categories. At the same time, curatorial voice and scholarship are preserved and promoted: how visitors find art works for them, but what they find is authentic Met scholarship. The Collections section breaks down into several subsections, each geared to the multiple pathways to understanding that we offer visitors. 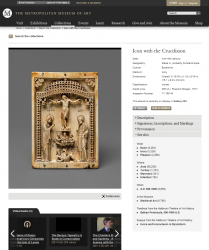 Browse Highlights features about 2000 significant and popular objects, presented in a new, randomized order daily. An editor selects an Artwork of the Day daily, relating the collection to current events and important dates in history. 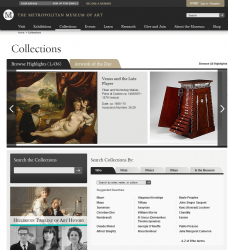 Search the Collections offers direct access to the full online catalog of objects. Galleries and New Installations put the Collections in the context of the physical space, furthering the Museum’s goal of supporting and encouraging physical visits to the institution. 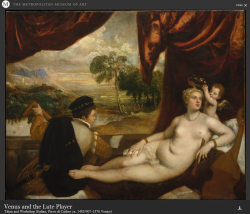 Connections offers personal, thematic takes on horizontal slices of the Collections, and the Heilbrunn Timeline of Art History continues its course of accessible and highest-quality scholarship. The new art object page, at the heart of most of these sections, is ground-breaking in many ways. Subject classification—by maker, by region, by date, and by media—situates every object in the Collection, making sense out of the Met’s overwhelming vastness. Links to related essays and timelines in the Heilbrunn Timeline of Art History provide broader context for nearly every object in the Collection. Every object becomes a step on a continuing journey of appreciation for and understanding of art and art history. Finally, the Met has now released all available full-size, 4000 pixel images of its public domain artworks for public viewing and reuse. We deliver them either as full-res downloads available for educational and non-commercial use, or within the Museum world’s fastest, smoothest, and most beautiful full-screen viewer. We hope that our example will convince other museums to follow suit and release images of public domain works to the their publics metmuseum.org/collections main page as well.